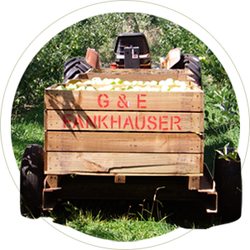 The Fankhauser family has been growing apples in Australia for over 120 years. We are currently situated in Drouin in West Gippsland, Victoria and have been growing apples from that location for more than 30 years. The owners Liz and Glynn Fankhauser, are 3rd generation orchardists and with their son Brad, grow around 1000 tons of apples each year. We grow seven different varieties of apples starting with Gala that are harvested around late February, Jonathon, Golden Delicious, Fuji, Granny Smith, Pink Lady and have recently started growing JazzTM under license for Montague Fresh. 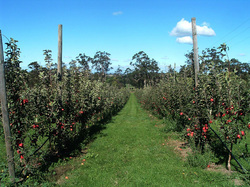 The growing of apples is a very labour intensive business that has four main seasonal jobs. During winter, the apple trees are pruned and shaped to try and get the highest possible yields. Over spring, new trees are planted and the older trees are thinned. This process requires the excess fruit to be removed by hand in order to leave the best apples on the tree to achieve the correct size and quality. Summer time requires a constant approach to watering the trees with an often limited amount of water. The trees are monitored every day, and watered only the amount that is needed. During autumn, the fruit is harvested. At this stage we can employ up to an additional 20 casual staff depending on the seasonal requirements. The apple trees then start to lose their leaves and head into dormancy for winter.